Remember that George Soros told the world that gold is a bubble and afterwards invested heavily in gold? Gold’s 23 percent surge this year to a record is proving no deterrent to George Soros, John Paulson and Paul Touradji, whose investments signal more gains for the longest winning streak in at least nine decades. The purchases show how investors are snapping up hard assets as governments and central banks led by the Federal Reserve pump more than $2 trillion into the world financial system. Gold in exchange-traded products, as much as half of which may be held by individual investors according to BlackRock Inc., is equal to more bullion than the official reserves of every country except the U.S., Germany, Italy and France. Gold gained 87 percent since September 2007 when the Fed began cutting benchmark interest rates and global credit markets started to falter. The Standard & Poor’s 500 Index of shares is down 21 percent since then, even after last year jumping 23 percent, the most since 2003. The Fed has kept its benchmark interest rate near zero since December 2008 and plans to pump another $600 billion into the economy through June by purchasing government bonds, a program known as quantitative easing. The central bank bought $1.7 trillion of securities in a first phase that ended in March. The U.S. Dollar Index, tracking the currency against six counterparts, slumped 8.5 percent in the third quarter, the most in eight years. Gold, which doesn’t pay a dividend, reached a record $1,424.60 an ounce in London on Nov. 9 and was at $1,351.65 at 3:47 p.m. Prices are heading for a 10th consecutive annual gain, the best performance since at least 1920. The S&P 500 Index returned about 9.5 percent with dividends reinvested, according to data compiled by Bloomberg, and Treasuries returned 7.3 percent by Nov. 19, a Bank of America Merrill Lynch index shows. Other precious metals have done better this year. Silver futures rose 61 percent through Nov. 19 and would have to gain another 85 percent to reach the record $50.35 an ounce reached in New York in 1980. Palladium advanced 72 percent in London and would need to add another 60 percent to match the all-time high of $1,125 an ounce reached in 2001. Investors bought shares of ETPs representing 1,081 tons of silver worth $945 million since the end of September, according to data from four providers compiled by Bloomberg. 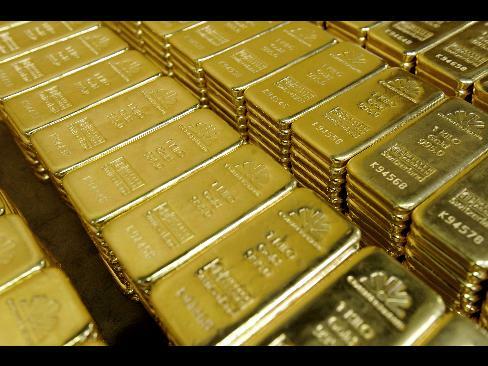 Gold in ETPs such as the SPDR Gold Trust, the biggest, fell 9.5 tons. Investors may have considered silver cheap relative to gold and bet that it would benefit from the economic recovery, said Daniel Briesemann, an analyst at Commerzbank AG in Frankfurt. Industrial applications account for 9 percent of gold consumption, while for silver it’s about 50 percent of demand, according to GFMS Ltd., a London-based research firm. Speculators in Comex gold futures cut their net-long position, or bets on higher prices, by 11 percent to 218,479 contracts in the week ended Nov. 16, data from the Commodity Futures Trading Commission show. That’s still about 40 percent more than the average over the last five years. Soros, who made $1 billion breaking the Bank of England’s defense of the pound in 1992, described gold at the World Economic Forum’s January meeting in Davos, Switzerland, as “the ultimate asset bubble.” Buying at the start of a bubble is “rational,” he said. Gold rose more than eightfold from 1976 to 1980, reaching a then-record $850, before plunging 67 percent to as low as $284.25 over the next five years. That peak adjusted for inflation is equal to $2,266 today, based on a calculator on the Federal Reserve Bank of Minneapolis’ website. Paulson & Co., which manages $33 billion of assets, is the largest investor in the SPDR Gold Trust and Johannesburg-based AngloGold Ashanti Ltd., Africa’s biggest producer, an SEC filing Nov. 15 and data compiled by Bloomberg show. The New York-based fund is run by John Paulson, 54, who bet against U.S. mortgage markets amid the subprime crisis. The company’s funds generated profits of more than $3 billion in 2007. Soros Fund Management, which according to Soros’s website manages about $27 billion of assets, cut its holding in the SPDR Gold Trust in the third quarter, and bought a stake in iShares Gold Trust, also backed by bullion. Soros listed NovaGold Resources Inc., based in Vancouver, and Kinross Gold Corp., based in Toronto, among his fund’s 10-biggest holdings in an SEC filing Nov. 15. Touradji Capital Management maintained a holding worth about $88 million in Toronto-based Barrick Gold Corp., the world’s biggest gold mining company, an SEC filing on Nov. 12 showed. New York-based Paul Touradji, 39, also bought a stake worth $1.7 million in Phoenix-based Freeport-McMoRan Copper & Gold Inc., the filing shows. The data on the holdings reflect the funds’ positions as of the end of September. Spokesmen for the fund managers declined to comment. Investors in options on Comex gold futures are anticipating the rally will continue. The second-most widely held option gives holders the right to buy gold at $2,000 by November 2011. Investors in gold-backed ETPs bought shares representing 290 tons this year, worth $12.6 billion, data from 10 providers show. Investment overtook jewelry as the biggest source of demand last year for the first time in three decades and will retain the top spot this year, according to GFMS, which has a team of 18 precious metals analysts. Euro Pacific’s Pento says gold will go as high as $1,800 by the end of next year. Pento correctly predicted in September 2009 that gold would reach $1,200 before the end of the year and in July this year forecast $1,400. Allison Nathan, Jeffrey Currie and other analysts at Goldman Sachs in London, New York and Hong Kong, are forecasting $1,650 in 12 months. Precious metals will return 30 percent over the period, more than energy, industrial metals and agriculture, they said in a report Nov. 9. “I flagged gold, not as a potential return to the gold standard, but as an indicator of lack of confidence in the growth policies,” World Bank President Robert Zoellick said in an interview Nov. 10. One-month implied volatility on the euro against the dollar climbed to 14.49 earlier this month, the most since June.